A dozen protesters gathered near the Belarusian Embassy on September 16 to commemorate the 15th anniversary of the disappearance of two critics of Belarusian President Alyaksandr Lukashenka. The demonstrators demanded answers about the fates of opposition leader Viktar Hanchar and businessman Anatol Krasouski, who vanished in Minsk on September 16, 1999. The rally was held in the late afternoon, when the embassy was still open, though no Belarusian diplomats emerged from the building during the hourlong protest. Earlier, the U.S. State Department urged Minsk to “transparently investigate” the disappearances of Hanchar, Krasouski and two other men, Yury Zakharanka and Dzmitry Zavadzski, who vanished in 1999 and 2000, respectively. All of the men are presumed dead, and their relatives believe Belarusian secret services are responsible for their abductions and possible murders. 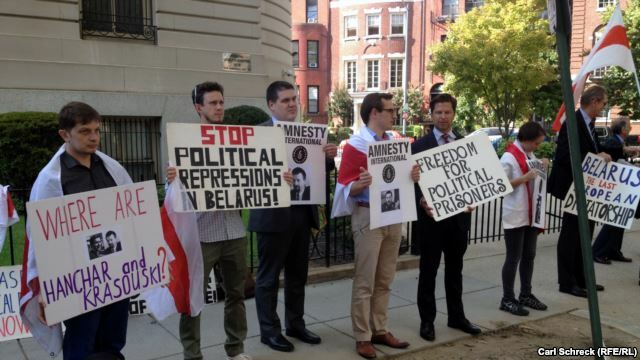 "The main point of this protest is to remind the Belarusian government about these disappearances, because nothing has been done to investigate these disappearances after 15 years," said protester Viachaslau Bortnik, the country specialist for Belarus at Amnesty International USA. The rights watchdog organized the demonstration together with the Belarusan-American Association (BAZA). Alice Kipel, vice president of BAZA’s chapter in Washington, said that while Belarusian diplomats did not come out to speak to the protesters, they were aware of the demonstrators' demands. Bortnik said he was pessimistic that the world would learn the fate of the four men as long as Lukashenka remained in power. "I’m not sure if we’ll find out about the fate of these people, at least during this regime,” he said. Valery Kavaleuski, a former Belarusian diplomat who attended the protest, was more optimistic. "We are convinced that sooner or later we will learn what happened to these people, that the truth will come out sooner or later, because there were too many people involved in this, and there were reports, there were documents published in the early days of the investigation,” said Kavaleuski, who was previously stationed at the Belarusian Embassy in Washington. A rapporteur from the Parliamentary Assembly of the Council of Europe (PACE) concluded in 2004 that senior Belarusian officials "may themselves be involved" in the disappearances of Hanchar and Krasouski, and that "steps were taken at the highest level of the state to actively cover up the true background" of their vanishings. Hanchar was a former Lukashenka campaign official who later joined the opposition, while Krasouski was a successful businessman critical of the Belarusian president. Krasouski’s widow, Irina Krasovskaya, lives in the Washington area but was traveling abroad on the day of the protest. She told RFE/RL in an email that while 15 years have passed since her husband’s disappearance, the pain remains.